CarHeroes is honored to present a wonderful example of pure vehicle design... this 2018 Chrysler Pacifica Touring L only has 39,014mi on it and could potentially be the vehicle of your dreams! This Chrysler includes: PREMIUM AUDIO GROUP HD Radio Power Passenger Seat AM/FM Stereo Satellite Radio Passenger Adjustable Lumbar Premium Sound System Telematics Auxiliary Audio Input MP3 Player GRANITE CRYSTAL METALLIC CLEARCOAT RADIO: UCONNECT 4 AM/FM Stereo Satellite Radio Telematics Auxiliary Audio Input MP3 Player ADVANCED SAFETYTEC GROUP Variable Speed Intermittent Wipers Lane Departure Warning Automatic Parking Lane Keeping Assist Intermittent Wipers Back-Up Camera Brake Assist Adaptive Cruise Control Blind Spot Monitor Rain Sensing Wipers BLACK/BLACK/BLACK, PERF LEATHER BUCKET SEATS Leather Seats Bucket Seats ENGINE: 3.6L V6 24V VVT UPG Flex Fuel Capability V6 Cylinder Engine 8 PASSENGER SEATING Rear Bucket Seats Pass-Through Rear Seat Bucket Seats *Note - For third party subscriptions or services, please contact the dealer for more information. * How to protect your purchase? CARFAX BuyBack Guarantee got you covered. This is the one. Just what you've been looking for. 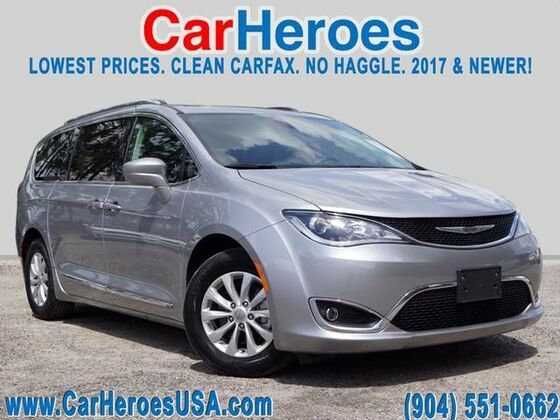 There are many vehicles on the market but if you are looking for a vehicle that will perform as good as it looks then this Chrysler Pacifica Touring L is the one!